As you can see that Stop Work Order, thousands of dollars in (unpaid) fines and the little matter of this building being zoned as a hotel are doing a smash-up job of deterring Greenpoint’s good friend, Max Stark, from shilling his illegal apartments. How much more “in your face” can it possibly get than this? This is a disgrace. 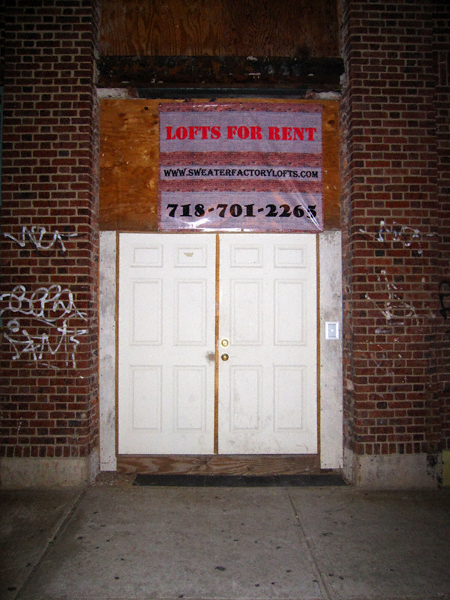 their website claims that this building is “by the front edge of mccarren park”. uh, no, it is not. Not to mention that they have no place to put their garbage (like cans or a dumpster), so the trash is dumped on the street, much like their former neighbors at Studio B. I don’t get how anyone would move in this place and think “score!” Half of it is still unfinished. And check out the window boxes on the Meserole St side that an optimistic tenant put in. Last night (after 10 p.m.) when I walked by one resident was doing a little drum practice. Because after 10 p.m. on a week day is the time to do such things. Lucky you. does anyone understand why the building dept.. or someone in nyc put a stop to this? why is all this allowed to go on? I walked by there today with a friend who has been in real estate and built buildings most of his adult life. He immediately stopped and noted that there is insulation around the front windows that is obviously showing and said that it’s usually a good sign the building has bad insulation and/or it’s settling pretty fast. He was disgusted. The garbage violation is going to get them into more trouble, faster, than anything else. my complaints to 311 regarding the C of O violation are still in DOB BIS but nothing happening yet. I did see an official looking person with a clipboard down there last week but it could have been another broker. Seriously, call 311 about the garbage. I’ll do it the next time I see it. And did everyone notice the for sale/for rent sign on studio b??? Yup. I’d call the FDNY regarding 239 Banker. There’s no way in hell that building is compliant with fire code. What’s more, the FDNY actually gives damn.